Before I go any further I would like to first explain a little bit about myself. Even though I have used Microsoft products since MS-DOS, I am not a Microsoft zealot. That’s not to say that I hate their products either; I love the Natural Keyboard 4000. 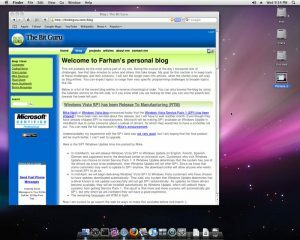 I think that Microsoft Office 2007 is a great product and that Windows Explorer is a good file system browsing program. OneNote 2007 is awesome. Furthermore, I have experienced several other operating systems (OS) like Linux (ArchLinux the most with the longest uptime of 120 days, ubuntu after that, and a short encounter with gentoo), and some FreeBSD. 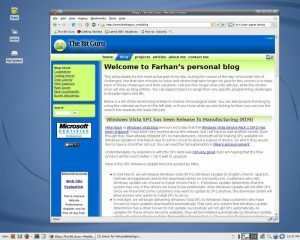 My main OS is Windows Vista, which I have used since March of last year (2007), and I have a file server running ArchLinux, which I administer only through SSH. I would like to say that I know what Apple’s OS X is all about, but, unfortunately, I never got around to committing to an OS that I couldn’t easily back out of (that’s another topic in and of itself; I have been very curious about the recent hackintoshes 🙂 ). Finally, I consider myself very much a power user. As with all of my previous reviews and commentaries, my goal is to not be biased, but I do realize that the nature of this article will make this a little hard. Microsoft has always been a very developer oriented company. I think this is one of the main reasons why it has dominated the industry. Pick any one of their products and you will see that there is at least a minimalistic Application Programming Interface, if not a full fledge view into the product’s data store. You can also see this by the fact that they have architected several programming languages, and that Visual Studio is one of the best developer software, if not the best. Microsoft’s operating system (OS) falls between Apple’s OS, which tends to be simpler and more user-friendly, and the open source operating systems like Linux, which in the past have been complicated and not as user-friendly. Previously, Microsoft did not have very much competition when it came to the operating system market so they continued with their mostly developer focused, feature full products that weren’t the easiest to use. Up until two or three years ago, their approach was acceptable by the majority of computer users since there weren’t many options. But, with the advent of the iPod, which gave Apple lots of extra resources (read money and oomph) to devote to other products, and the continuous progress of Linux, things have changed. Even though right now these alternatives are a very small part of the market compared to Microsoft’s dominance, these alternatives are catching up very quickly. 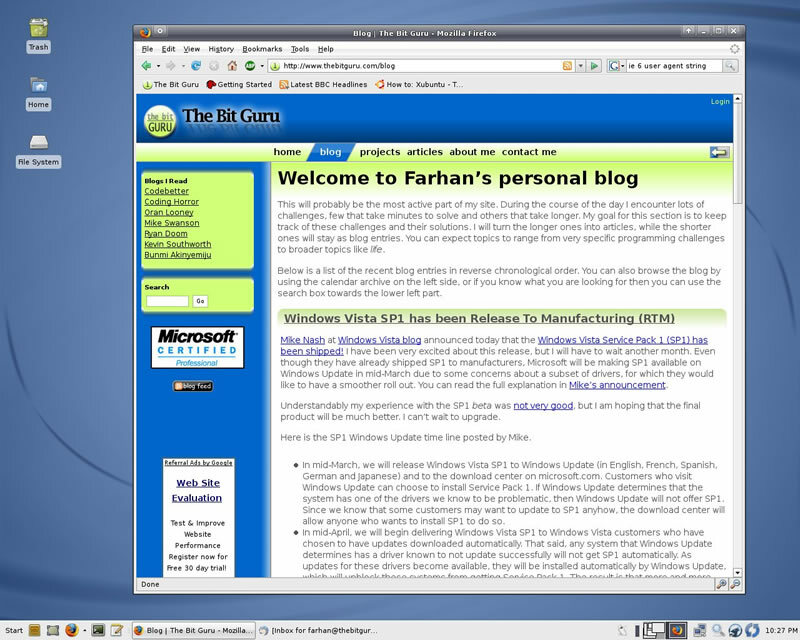 The very brave, flexible (flexibility in the sense that they can live without a given Windows software) and resourceful (resource mainly being time) people have already switched their operating systems, but for the rest of us, Windows Vista is a very good sign that Microsoft has not only realized but also started adjusting to the market needs. “Needs“ might seem like an exaggeration, but as Mac and Linux operation systems get more user-friendly, people will start migrating to them and once the user base is large enough, the desire for a more user-friendly environment will turn into a need. 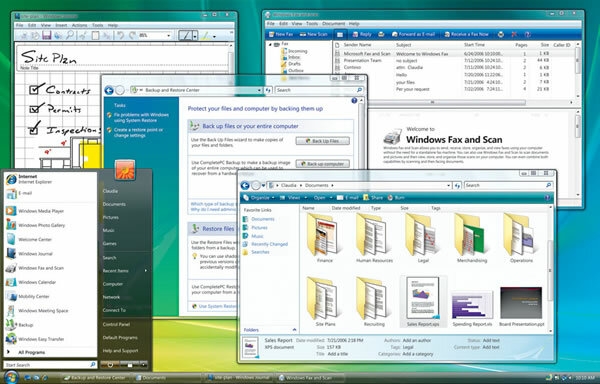 Overall Windows Vista is definitely an advancement of Windows XP, in that it has tons of new and improved features. The problem comes in with a small subset of these features that was implemented poorly. What’s even worst is that some of this small subset consists of things that come in direct contact with the user. User Account Control is one good example; the copy dialog box is another one. Additionally, previous versions of Windows were not as strict about security as Vista is. By security I am mainly referring to the stricter file system permissions, which tends to be one of the main reasons why older programs fail to install or run on Vista. 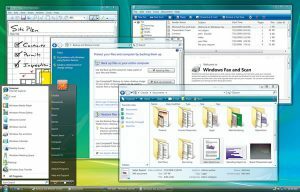 Once again, Vista provides file system and registry virtualization, but the lack of information about this functionality and the fact that so many applications are still failing due to file system permissions leads us to the conclusion that this feature is also not implemented as well as it should have been. Furthermore, over the lifetime of Windows XP people have written software to do the things that it was not doing, but should have done. The user needs have also changed vastly over this time period. For instance, five years ago quick file system searching was not a requirement, but in todayÃ¢â‚¬â„¢s world, your OS will not be complete without this functionality. So, Windows Vista is providing most of these in the base OS, but, unfortunately, most users donÃ¢â‚¬â„¢t look at these as features. What is ironic is that these same users tend to envy Mac for providing all the basic and not so basic features right out the box! Usability-wise, Windows Vista makes tasks easier and quicker than Windows XP. 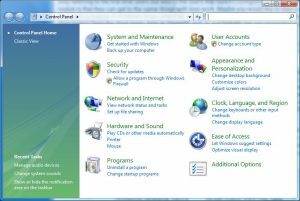 If you use a program often enough then it will already be in the Start menu; which is a feature that it inherited from Windows XP. For the more rare programs all you have to do is open the start menu, type in a few characters and off you go. Microsoft decided to rearrange the items in the control panel so that they would make more sense to new users. Most people don’t like this because they are used to where things use to be. Also, by new, I am not only referring to the first time users but also to the users that haven’t configured a given feature. What they don’t realize is that they can get to the same things with less work. 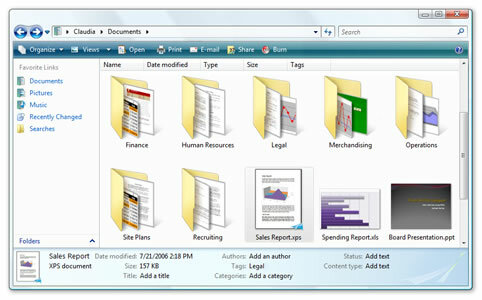 Maybe you would like to start using the Speech Recognition feature of Windows Vista, where do you go? Well, the same place where you have always been, the Start menu! 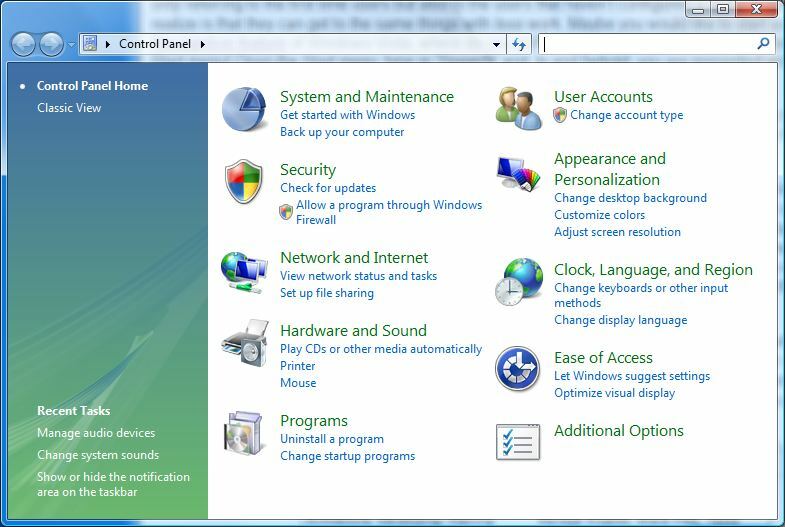 Open the Start menu, type in “Speech” and, lo and behold, you are presented with the speech recognition control panels. Add to that the fact that current users are expecting simpler decisions while Microsoft wants to bombard them with numerous flavors of the OS, and you get chaos. Unfortunately, with the high competition that is currently in the operating system market, this chaos is working against Vista’s favor. Let me say one thing before anyone goes flaming at me saying that there too many editions of Windows Vista. I realize that XP now has almost the same number of editions, but I would like to point out two things. First, XP started out with only two editions, Home and Professional. The rest of the editions have been coming out over a long period since then. Second, I believe that Home Basic, Home Premium and Ultimate editions by themselves are too many versions. Add to that one more, the Business edition, and you end up with way too many. Don’t forget that there is also the Enterprise edition! Microsoft may have thought that this segmentation will get them more profits, but it seems that it might be hurting them more than helping. So, above is what I see when I look at Windows Vista. Next up I will explore the first, and what I think of as the biggest issue with Windows Vista, application compatibility. I already gave you a little flavor of my view on this topic, the actual section will dive deeper into it. I will explain what is wrong, what Microsoft has done and can do next, and finally what you can do about it right now. You can subscribe to the RSS feed if you prefer to be notified as new sections are added.